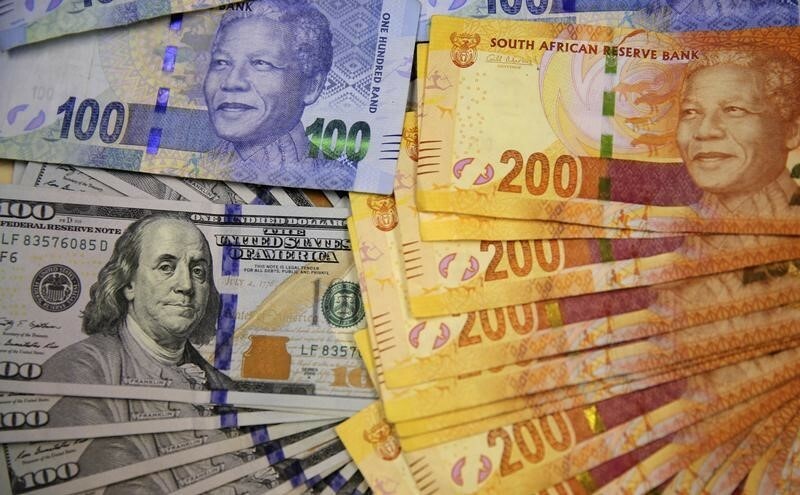 (Bloomberg) — South African businesses are flush with money. Too bad they aren’t willing to spend it at home. They’re hoarding cash or expanding abroad, put off by a stagnating economy, power shortages, low commodity prices and slower growth in export markets China and Europe. Delays in passing business regulations and a dispute between President Jacob Zuma and Finance Minister Pravin Gordhan are compounding their unease. Their reticence comes even though a plummeting rand is making South African exports cheaper, which should encourage the creation of new capacity. It has dived 56 percent against the dollar over the past five years, the worst performer of 16 major currencies monitored by Bloomberg. That’s done little to boost output: Growth has averaged 2.1 percent a year since 2011 and the central bank Wednesday forecast an expansion of 0.6 percent this year. A business-confidence index compiled by the South African Chamber of Commerce and Industry slumped to 82.5 in April from a peak of 104.2 in March 2011. Non-financial private companies had 725 billion rand ($45.4 billion) on deposit in South African banks at the end of March, up from 670 billion rand a year earlier, South African Reserve Bank data shows. Fixed-capital formation by businesses increased just 0.4 percent after inflation in 2015, after declining 3.4 percent the year before. Little could be less certain than Gordhan’s political future. He was reappointed in December to a post he held from 2009 to 2014 — but only after markets went into freefall over the unknown whom Zuma had previously named to the finance ministry. Gordhan’s goals of reducing the budget deficit and improving the management of state-owned companies to ward off a junk credit rating haven’t endeared him to the president. The government is making a concerted effort to increase the country’s productive capacity, according to Rob Davies, the trade and industry minister. Companies were granted 10 billion rand in tax breaks and other incentives in the year through March, which enticed them to invest 57.2 billion rand, he said in a May 9 speech in Johannesburg. Those betting on South Africa include BMW AG, which announced plans in November to spend more than 6 billion rand at a plant that will produce the newest model of its X3 sport-utility vehicle, and MTN Group Ltd., Africa’s biggest wireless operator by sales. It plans to invest about 12 billion rand in the country this year. A number of mining companies, which have been hard-hit by the commodity slump and a depletion of deposits in South Africa, have chosen opportunities elsewhere. Gold Fields Ltd., then the world’s fourth-largest gold miner, decided to spin off all but one of its South African operations in 2013, while AngloGold Ashanti Ltd., the third-largest, tried to do the same the following year. Harmony Gold Mining Co., which gets 95 percent of its production from South Africa, is taking advantage of a recovery in the rand gold price this year to build a war chest to invest in a new project in Papua New Guinea. Anglo American Plc plans to sell coal and iron ore assets in South Africa. In addition to political turmoil, South Africa is experiencing policy limbo. Executives including Christo Wiese, South Africa’s richest man, and Johann Rupert, the billionaire chairman of Cie. Financiere Richemont SA and Remgro Ltd., have complained that policy making is haphazard and ill-considered. Banks are up in arms over proposed new laws that will enable the government to expropriate property without having to pay compensation at market prices, on the grounds that it will undermine owners and mortgage holders’ rights. Private security companies have objected to parts of a law awaiting Zuma’s signature that will force them to be locally controlled. Parliament has taken years to process laws that intend giving the state a 20 percent free stake in all new energy ventures and enabling the mines minister to force companies to sell strategic minerals to local manufacturers, making commodity producers uncertain. Then last month, the government published new rules proposing that all mines should maintain 26 percent black ownership. The Chamber of Mines, an industry body, said its members weren’t consulted on the changes, which would prejudice existing shareholders. “Investors who give us their money for projects have political risk very high on their radar,” said Johan Theron, spokesman for Impala Platinum Holdings Ltd., the world’s second-largest producer of the metal.